Attaching blue snowball mic to shock mount DIY. Photos at the bottom of the post! 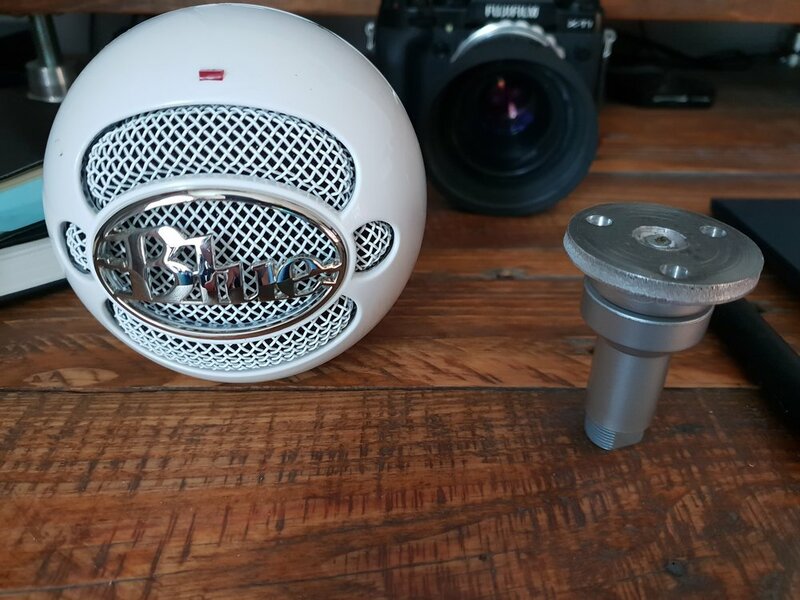 Super quick post about attaching my Blue Snowball microphone to a standard shock mount. 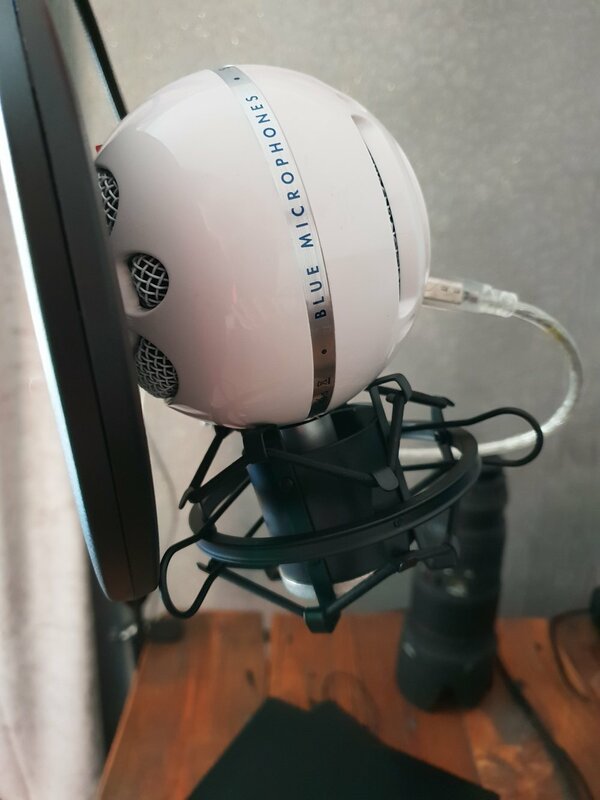 If any of you guys own a Blue Snowball mic, you’ll know that it’s pretty hefty in weight and a pretty decent size. So much so, that a shock mount from Blue is £50 and there’s like zero 3rd party options around. I wasn’t willing to pay that for one! I’d rather upgrade to a yeti and stick with a standard shock mount. I’ll apologise in advance as I didn’t take any photos during construction as I wasn’t planning on posting it. But as I couldn’t find much of anything about it online, I decided to post some after shots and a little how to of sorts. The first attempt was to just slide the tripod the mic comes with, through the shock mount hole, and open the legs. This kind of worked, but there was so much movement, that balancing the mic on top of the mount would have probably done the exact same thing. It also looked stupid. Next, I pulled the tripod legs off the stand. Immediately it looked better! Not that aesthetics are 100% important, but whatever. I found an aluminium disc that was the same diameter as the shock mount. I was planning to cut a circle of plastic or something similar, but this disc saved me that job. I drilled a hole in the disc centre and used the screw that held the tripod legs in placed to attach the disc to the mic stand. The screw broke.. I racked my brains for a few minutes and decided to strip out the rubbers that were in the mic tripod base. This left a little flute with the broken screw in. Getting the screw out wasn’t an option. I drilled a 12mm hole to attempt to counter sink and allow a split pin to go through the flute, but the flute is flush to the disc.. The last step to this was a tube of gorilla glue! I literally glue the disc to the mic tripod and filled the hole I created with glue. After a 24hr drying period, I screwed the mic and modified stand through the shock mount for an easy and relatively quick fix! I picked my shock mount and boom arm off Amazon for around £13 for both. 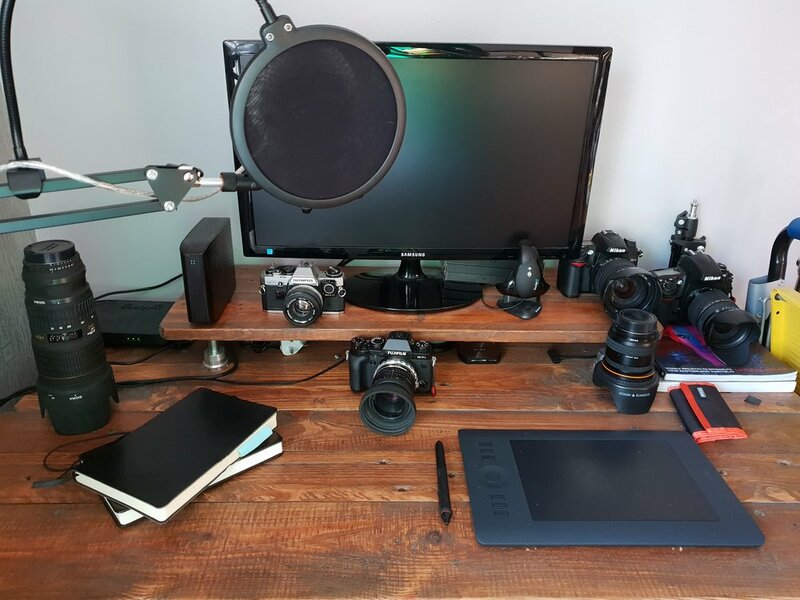 The boom arm isn’t the greatest, but it’ll do for now! Am I an award winning photographer?